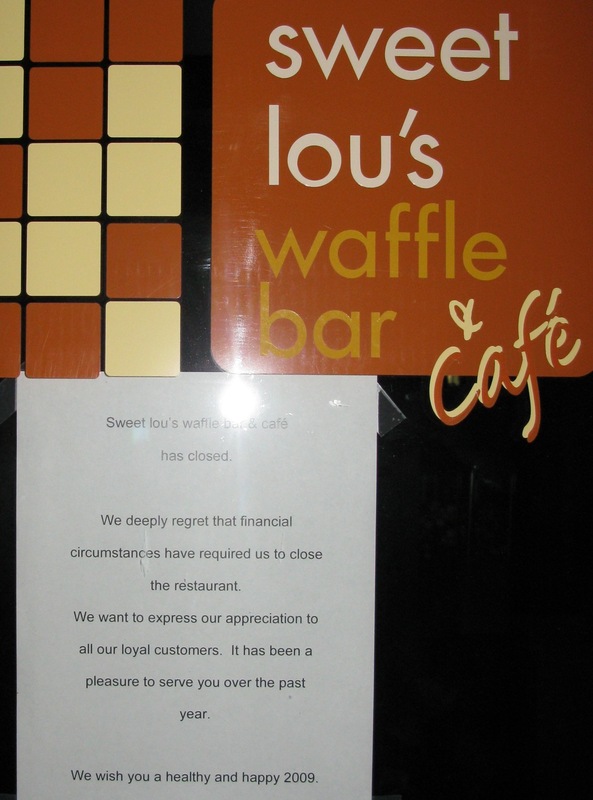 I got a heads-up from Norman Butler earlier this week that Sweet Lou’s Waffle Bar and Cafe would be shutting down soon. He had recently spoken with Lewis Newman, the owner. He told Norman that there’s a possibility the current managers would re-open the restaurant in the near future, but the sign on the door doesn’t indicate that. See today’s Northfield News: Sweet Lou’s closes its doors by Brenda Ward. I blogged about the opening of Sweet Lou’s just over a year ago. Does this mean that you can’t waffle on certain business decisions, you must be decisive? Oh, no more Sweet Lou’s. Darn. Norman suggested I talk with Louis E. Newman (Griff, you accidentally spelled Louis’ name incorrectly!) as well as the owners of the former Final Course Cafe and the stillborn Sprazzo’s. Newman and the owner of Final Course said they were not ready to talk about their experiences any further. Condolences to those businessowners who failed to succeed in this tough economy. Let’s hope we don’t see too many more. I’ll miss Sweet Lou’s. I hope the manager is able to buy the business. The food was great. Business can be very tough but Sweet Lou’s seemed like a strong concept and a great addition to Northfield … this is a true loss to the city. This begs the friendly reminder: if you like a business, anywhere in Northfield, then patronize it today. The first quarter is the toughest time for many small business. Cash flow is a huge issue and can make the difference of weathering a soft period and deciding to move on. Think of it as an investment, a donation or just indulging in your favorite entertainment or beverage or sweet treat. Hold your book club at a coffee shop or pub, invite some friends to join you for a beverage after work, buy your next book club book at Monkey See, get your oil changed, wash the salt off your car again, order a pizza…whatever suits you interests or budget. Maybe we can jump-start our own economic stimulus! Speaking of local businesses, can someone recommend someone who does tailoring/alterations? And I have a beautiful roll-top desk that needs refinishing, but I don’t have the time and skill to do it myself. I’d love a referral. If we all do a little it will have a huge impact. It is always sad to see a local business close its doors. We all have limited time, resources, energy…especially this time of year and many of us don’t want to walk down the sidewalks in this cold and yet we want to do business locally. I have a great experience to share. I needed to buy a Spanish Speaking ‘How to’ cd for my daughter who will be taking Spanish before she graduates college this year. So, I emailed Jerry at Monkey See Monkey Read. He immediately emailed me back with some options and after some clarifications on what I needed he gave me a recommendation. I took his advise and asked him to order it for me. This took very little time for me and Jerry was very helpful. He told me it will be in next week. I am so pleased to be able to do some shopping locally via email! Thanks Jerry! Let’s all keep thinking about ways we can support our local merchants! I agree with Mary about patronizing the folks in town — and there are some great deals right now. I bought a couple of tops at Anna’s Closet yesterday for half off, and as always, got great fashion advice (something I desperately need!) from Lucy, the owner. You won’t get that kind of help at the malls. Do not forget to patronize your local “locally owned” restaurants. This time of year is their slow period, and these small businesses need the cash flow to maintain operations. Eat Local, Shop Local, and keep Northfield’s economy going. I just found out something new today. There is a new type of restaurant delivery in town! BEEF ‘O’ BRADY’S NOW DELIVERS!!! The salads as well as the sandwiches, and Fish and Chips are great delivered! They also have BBQ Wings, Burgers, Ribs, and shrimp. There are also lunch specials Monday through Friday. On these frigid nights coming up, this is a fresh new alternative… It works pretty spiffy! Thanks for the shout out John. It is true. Beef’s has delivered since we opened last January(almost to our one year woo hoo!) however it’s something that most people don’t know about. So, if you’re ever in the mood for Beef’s but don’t want to make the trek out to the store just give us a call 507/664-9112 and we’ll bring it right to your doorstep.